Welcome home to the best studio in Tudor City! 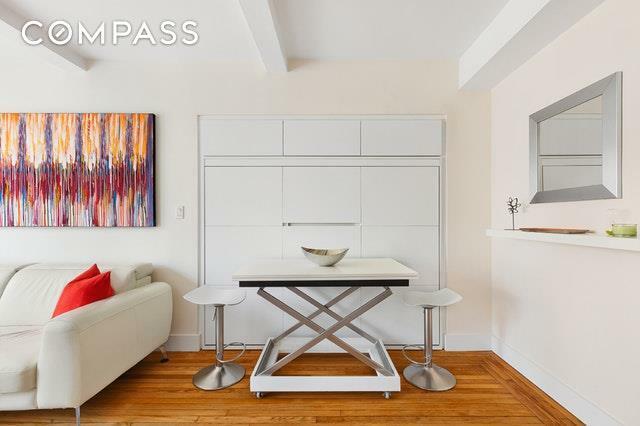 Unit 502 has been gut renovated with the utmost attention to detail to maximize storage and space. 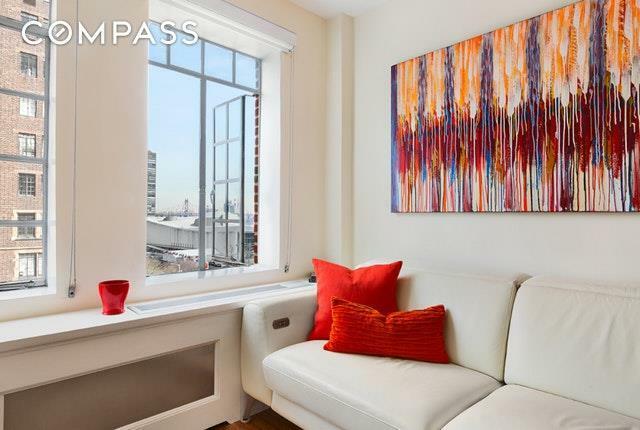 This bright and airy studio features a beautifully renovated kitchen equipped with full size stainless steel refrigerator and stove. Storage is abundant with extra kitchen cabinet space and customized shelving and drawers throughout. With a central heating and air conditioning system, there is no need for a bulky window unit.The custom designed murphy bed is an added bonus, beautifully tucked away with additional hidden storage for all of your belongings. It is truly amazing the amount of storage that is in this studio! 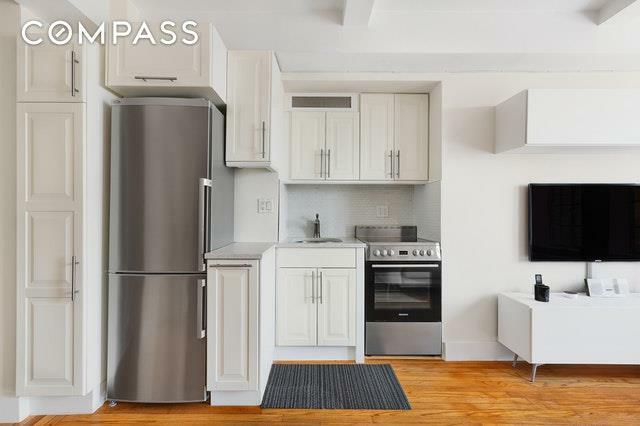 The spacious bathroom features gorgeously maintained original pre-war flooring and tiles and a refinished original cast iron tub.With wide open views of the East River and Queensboro Bridge, unit 502 is move-in ready and truly one-of-a-kind! The perfect starter apartment or pied-a-terre, we cannot wait to show you this special unit.Built in 1929, 25 Tudor City Place is NON-SMOKING Gothic Revival building featuring an intricately designed faade, complete with cherubs and gargoyles, and a grand lobby with stained glass windows and carved dark-wood accents. 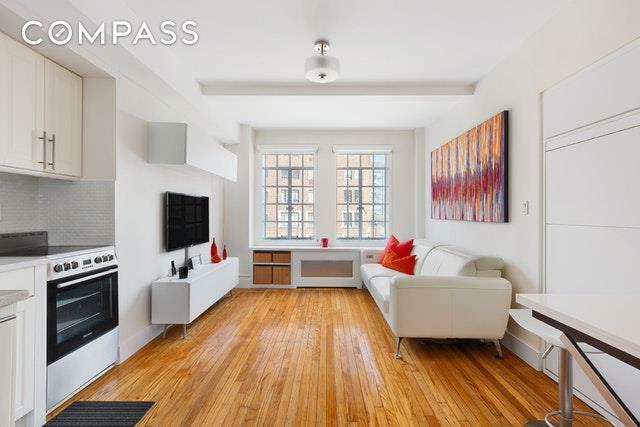 The very convenient location is in the heart of Midtown (and close to Grand Central) and set on a tranquil tree-lined street directly across from the privately maintained Tudor City Park and Gardens. 25 Tudor City Place is a completely smoke-free building featuring full time doorman, roof deck, laundry room and access to the fitness center at 5 Tudor City Place. Building welcomes cats but not dogs. Best of all, electricity is included in the monthly maintenance.